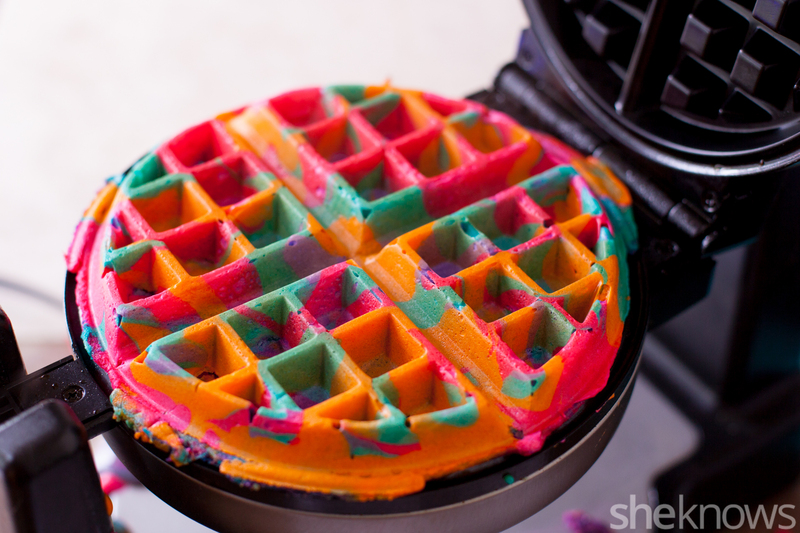 These bright neon waffles are an edible tie-dyed creation. 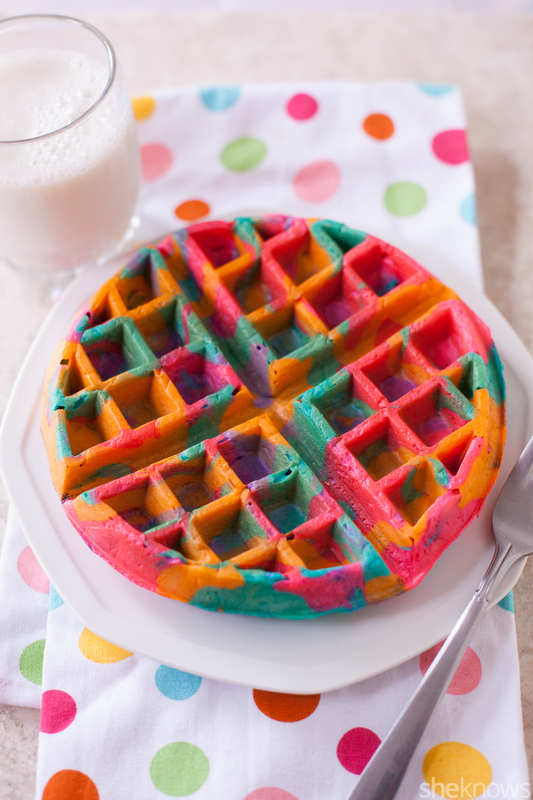 Tie-dye waffles might look like art, but they’re just as fun to eat as they are to create. 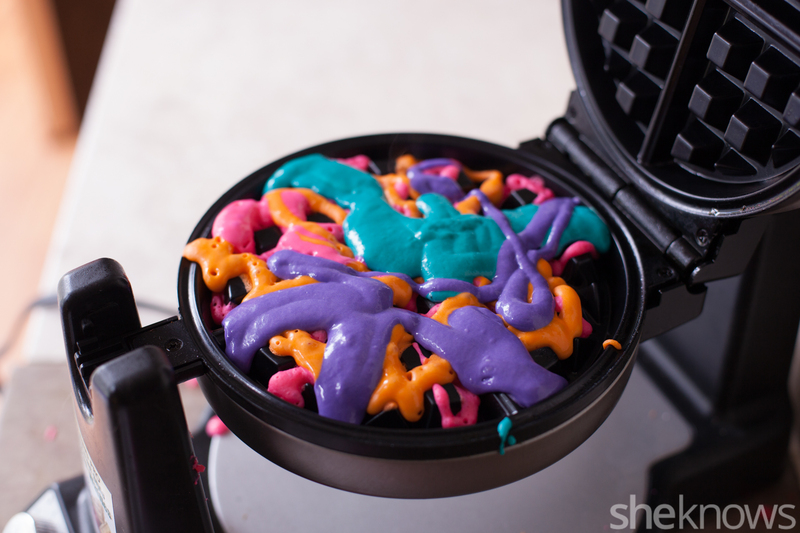 Kids can help you make them — just be sure to help them to be safe around the super-hot waffle iron. Start by making the waffle batter and dividing it among 4 zip-top plastic bags. I used gallon bags because that’s what I had, but quart-size are even better. 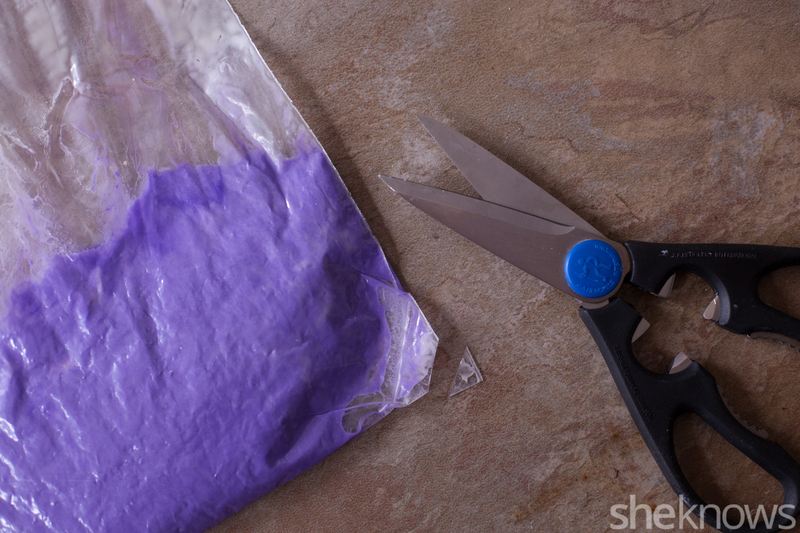 Mix a good amount of food coloring into each bag. I used the Wilton gel food colors in neon. The brighter the colors, the better! As you’re mixing, you can use a chopstick or other item to kind of squeegee the batter in the bag. This helps make sure the color mixes evenly. This technique is also helpful at the end to get the last of the batter out of the bag. 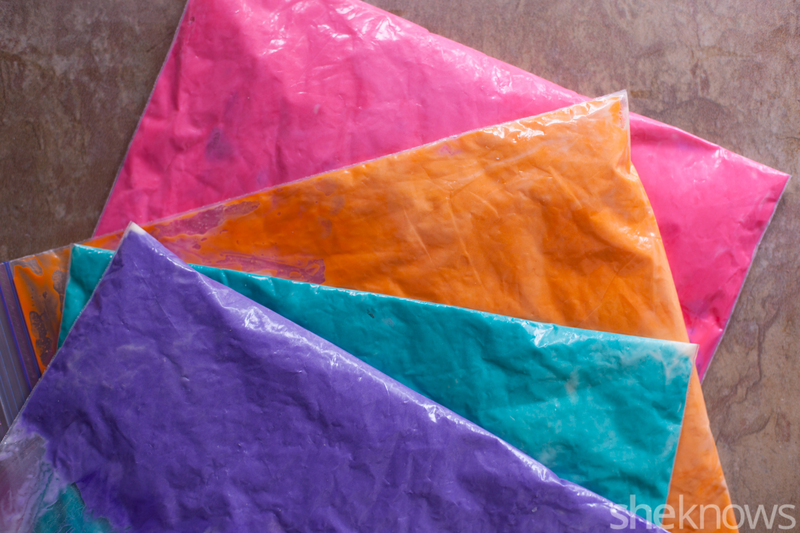 Now you should have 4 gorgeous bags of neon batter. Snip off a corner of each bag. 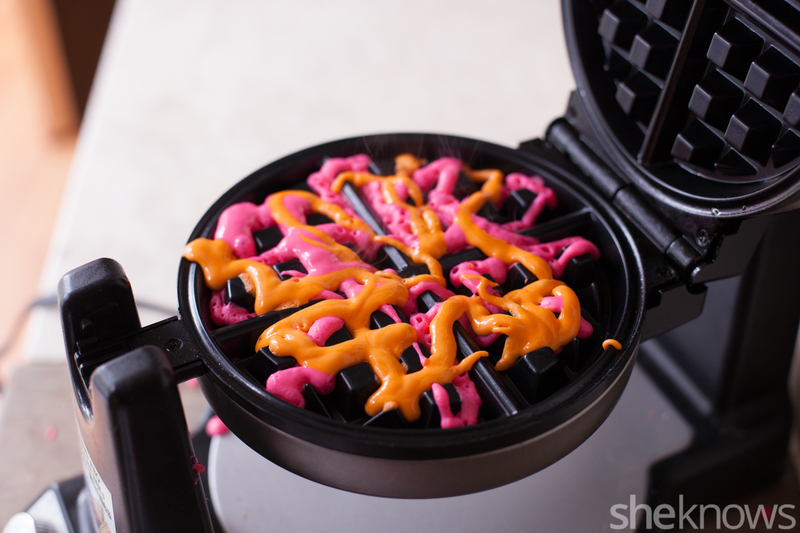 Spray the waffle iron with a spray oil like Pam. 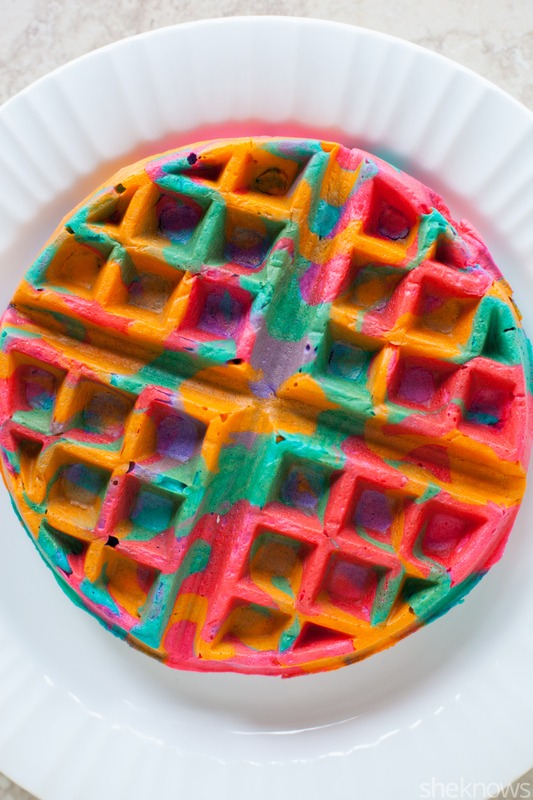 Squirt your first color onto the waffle iron. Add another color. 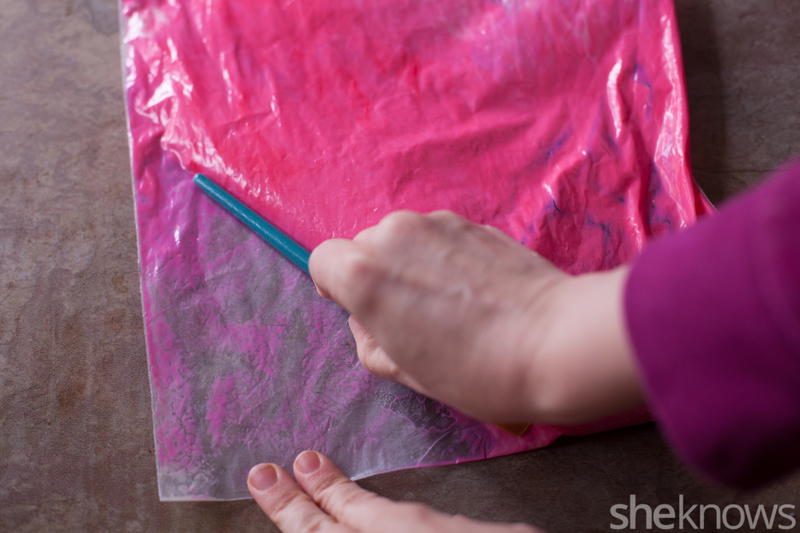 Squeeze it out in a squiggly pattern to help give the tie-dye effect. Add your next 2 colors. And a little bit more pink and orange for good measure. Close the waffle iron, and cook the waffle according to your iron’s instructions. I prefer a medium setting for these, because a darker setting starts to brown and dull the colors. 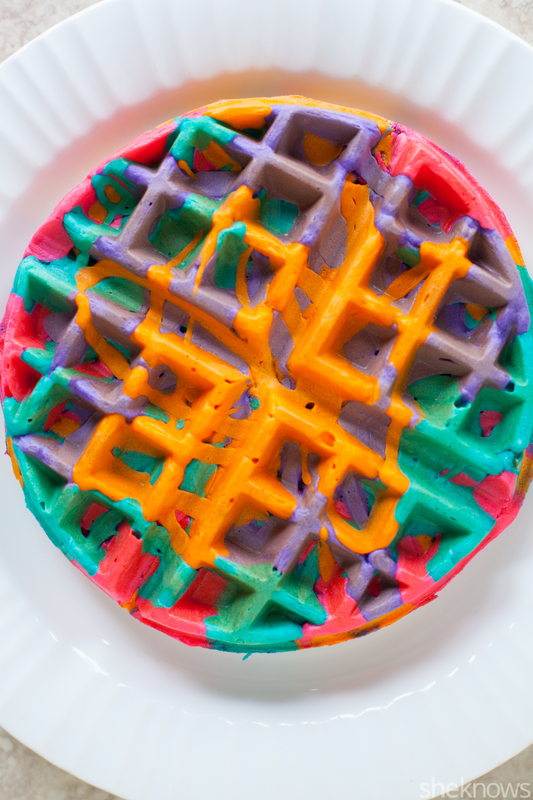 You’ll notice that the bottom side of the waffle will have lots of squiggles, since each color started to cook as it was squirted on. The top side is a little more swirled and blended like tie-dye. But you can serve whichever side up you prefer. 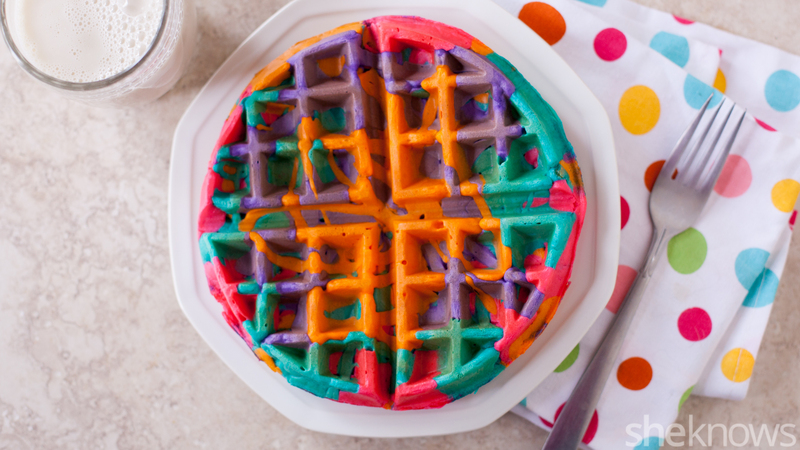 These tie-dyed waffles are a colorful work of art. You can use whatever colors you like, but bright neon colors work better than light or dark ones. Mix in the milk, eggs and melted butter. Continue mixing until completely smooth. 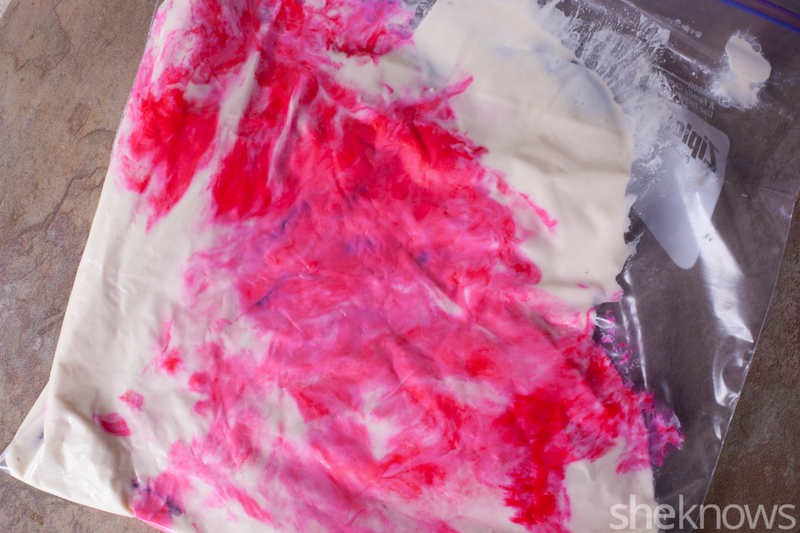 Divide the batter among 4 zip-top plastic bags, and dye each one a different color. 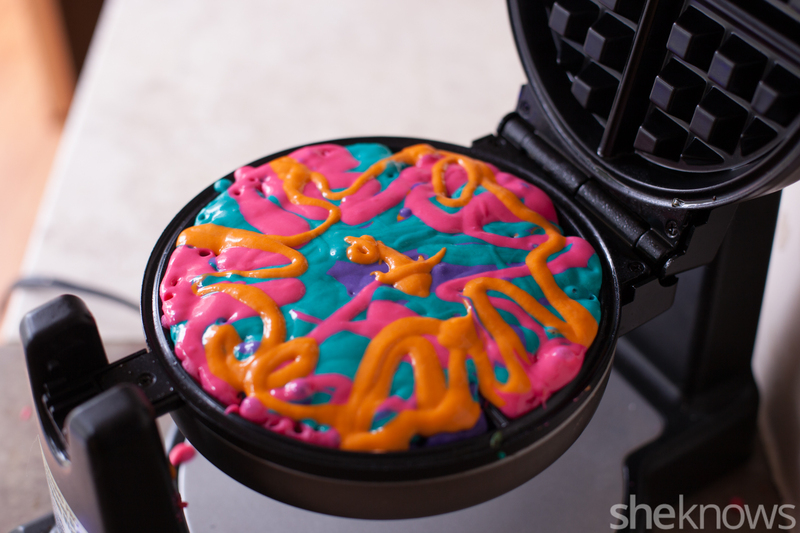 Spray the waffle iron lightly with oil. 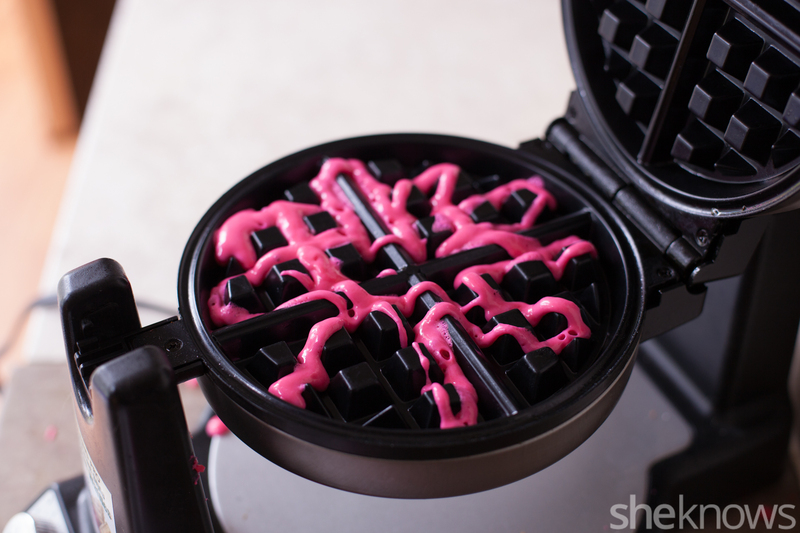 Squirt the batter in a squiggly pattern onto the iron, one color at a time. Close the waffle iron, and cook on a medium setting until done. Mine beeps when it’s ready. Don’t let it cook too long, or the colors will brown. Remove the waffle to a cooling rack, or lay it directly on the rack in your oven on warm. If you leave them on a plate, the bottom gets soggy. Continue to make more waffles with the batter, spraying the iron with oil every 2 waffles.